Black Friday! Be sure to take advantage of our door-busting specials on words! The first new-to-me-word today is pretty politically wonkish: the Thucydides Trap. 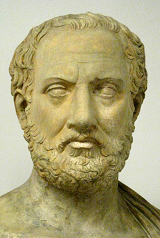 Thucydides was a Greek military commander who wrote a history of the Peloponnesian War, which pitted Athens against Sparta in the 5th century B.C. Inspired by the nature of this conflict, the political scientist Graham Allison coined the phrase Thucydides Trap in 2012 to describe the inevitable (?) conflict that will occur between a rising state (historically, Athens) and an established power (Sparta). I was reading a couple of articles about China this week (example), and Thucydides Trap appeared in both of them. You will undoubtedly be able to deduce which modern states correspond to Thucydides's players. For a second new-to-me word, and on a tack more appropriate for a cooking-focused holiday, I recently learned the word autolysis or autolyze. This refers to a biochemical process in which tissue breaks down—autolysis literally means "self"+"breakdown." I ran across it while perusing some holiday recipes, and discovered that it's a term and technique that shows up a lot in instructions for making different types of bread. In that context, an autolyze period is one in which you let a dough rest to allow it to break down some of the starch. For etymology, another foodish term: butter. A variant of this word shows up in all the Germanic languages, and in French (beurre), but curiously, not in Spanish (mantequía). Nonetheless, it does seem to have to come to us from the Latins, who in turn got it from Greek. As Kory Stamper, a Merriam-Webster lexicographer, notes, the origin is proposed to be bous ("cow") + tyros ("cheese"). The OED adds an interesting coda, that the word "is perhaps of Scythian or other barbarous origin." Those barbarians and their delicious fatty spreads! If the bu- part is for "cow," it's related to bovine. It's also then related to the excellent word boustrophedon, a word for writing alternatingly left to right and then right to left—i.e., the way an ox (bous) plows the field. Which the Greeks sometimes did. And maybe barbarians as well.